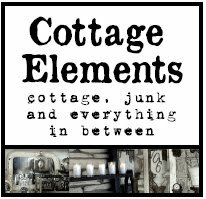 Cottage Elements: Reminder - Junkologie Blog Party in Oronoco! The day is almost upon us and I'm getting so excited. 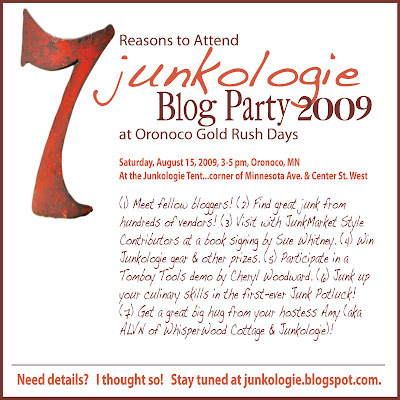 Just a reminder, Amy of Whisperwood Cottage and Junkologie, will be hosting a blog party this Saturday in Oronoco for Gold Rush Days. 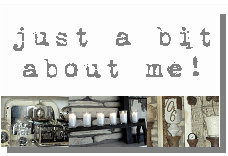 It'll be a great time to meet other Bloggers and Junkers! 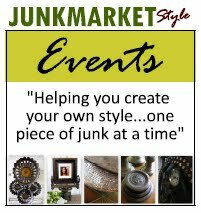 Also, Sue Whitney of JunkMarket Style will be on hand to sign her latest book, JunkMarket Style - Outdoor Edition, along with a few of us Contributors on the site. You can find more details on her website at Junkologie.Blogspot.com. Hope you can attend! Can't wait until Saturday! Everything is lined up and in motion. The Junk Potluck, the JunkMarket book signing, the Tomboy Tools demo...it's going to be a hopping place! I'm so glad you will be there!! Thanks for the shout out, Lani! See you soon!! Lani, I would love to be able to attend, but alas cannot. Please take plenty of photos and give Amy a big hug from me! I was really trying to make it happen, but unfortunately (for me) I won't be there. I would have loved to meet you and all the other contributors/bloggers. Have a great time! I'd love to go to any of these types of events sadly there's no junk art type following around here. I guess I need to move.